There comes a point in a hard workout where the thought of quitting starts to edge its way in, and it is at this time that a final reserve is called upon as we power through to the end, or not. 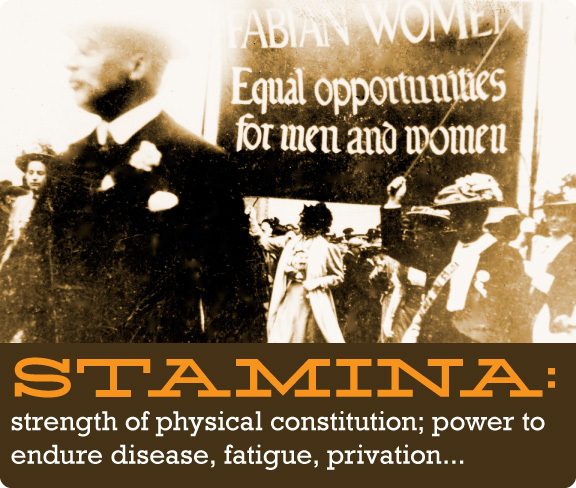 And that’s what we’ll be pondering on this week – stamina, what is it, where to find it and how it affects our exercise sessions. Stamina: that surprising moment when I realize I can do something previously thought unreachable – as in: running a 5K in 28 minutes. However, it wasn’t until my next run that I felt different, I was more confident in my pace, in my ability – all because my body had proved stronger than I gave it credit for. And yes, stamina fluctuates, that’s why I have good runs and bad runs, the body is not consistent in its temperaments. But what helps on the slow and tired days is the knowledge that this body can move when I need it to. When I put the training in day after day, and then try my hardest when it counts, my body’s stamina will come through and I’ll have the staying power to run at a fast pace. That’s pretty sweet.